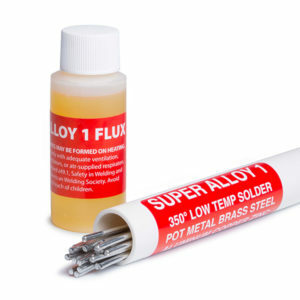 A first time welder uses Super Alloy 1 and a propane torch to repair white metal/pot metal. In response to customer requests, we are producing a “beginner” series of instructional videos. This video features Tawny using a propane torch and Super Alloy 1 to repair pot metal at 350 degrees. Step by step instructions are shown, enabling beginners to repair broken or pitted white metal parts like a pro. Super Alloy 1 can be used to join aluminum, bronze, steel, copper, white metal, or brass in any combination, at 350 degrees.